The Antec EarthWatts combines the most desired features in PC power supplies with unprecedented efficiency in design. 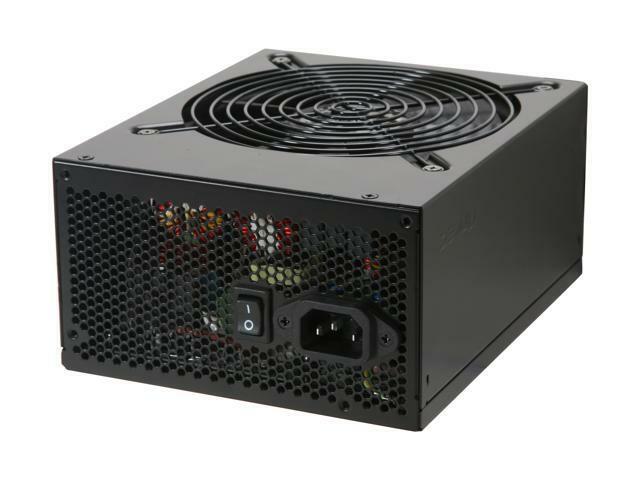 The Antec EarthWatts 750 power supply features 80 PLUS certification, saving energy and your money. It also generates less heat, and enhances cooling with a super-silent 135mm fan. The Active PFC circuitry further reduces impact on the power infrastructure resulting in cooler, quieter, and more environmentally friendly power. The Antec EarthWatts 750’s Universal Input capability together with ATX12V v2.3 compliancy enables you to use it in a variety of situations, and almost everywhere, without worrying about input voltages. Dedicated power circuitry, industrial grade protection circuitry, and Active PFC deliver safe, reliable output. The presence of one Main connector (20 + 4 pin), one 12V (4-pin), six Molex, nine SATA, one Floppy, and four PCI-E (2 x 6+2-pin, 2 x 6-pin) connectors are more than enough for all your components. Four +12V output circuits provide maximum stable power for the CPU independently of the other peripherals. Bring new power to your system with this remarkable supply! ATX12V Compatible Compatible with the ATX12V v2.3 standard, the Antec EA-750 750W power supply provides maximum power stability to drive the processors as well as other components for desktop and entry-level sever computer systems. 750W Maximum Power A maximum power of 750W delivers safe, reliable output for high-end gaming computer systems. Four industry-leading independent +12v rails are provided for more stable and safer power output. 135mm Silent Cooling Fan The Antec EA-750 features a 135mm thermally controlled fan for increased overall airflow and heat dissipation in the power supply enclosure. 3.4" x 5.9" x 7.1"
Pros: It's Never Given me ANY problems !!! Pros: I bought this power supply back in 2011 and I just realized that I forgot to leave a comment about it. If you can find this supply anywhere, I would highly, painfully recommend it. I bought it as a replacement to a really poor quality 450w supply that came with a pre-built system that I had bought from Dell and it's held on strong through countless upgrades and a slightly bent in fan due to an accident on my part. Literally one of the best supplies that I've ever had. Cons: Not modular, so you'll have to be sure that you have some decent cable management in your case so that things aren't floating everywhere (yay twisty ties!). Other Thoughts: I bought this for my gaming pc I built in 2009. It's still running strong, and will likely be used on my next build. Pros: Very Durable and Reliable. 4 Years of Usage and Still Working Perfectly! Pros: Nothing good to report. Cons: Like another reviewer, this PSU fried several hard drives for me. Over the course of a year, I ruined three HDDs. I replaced the PSU with a Corsair HX-750 and haven't had a system problem since (which is ~2 years). That would appear to be fairly clear evidence, that the Antec PSU was in deed the problem. Other Thoughts: This review is way too late to help anyone buying new, but it might be helpful for someone considering used. Pros: Semi - Modular design. to use it on my next system build. Cons: Semi - Modular - I wish I could just use the cables that I NEED and reduce the clutter. Other Thoughts: I owned this product for exactly 3 years and 4 months. Then one day it stopped working. Didn't take anything else with it. So I'm happy when it did work.